The Story Department: What's the Story? The Metro Screen story structure workshop sold out and it seems there will be another one soon. If soon is not soon enough, you can register now for an intensive one-day session on 1 June 2008. This one day workshop is intensive but fun. It teaches you to distinguish between those screenplays with a strong potential to reach a wide audience and those that are just a fun read. You will finally understand what the 'three-act-structure' really stands for. The workshop is packed with examples of great and not so great movies and at the end YOU will be able to point at the main causes for strong or poor box office results for most movies. The great careers in our industry are not built on volume of work but rather an informed choice of projects. This applies to writers, directors and producers but equally to screen technicians and particularly to actors. Why do you think Matt Damon is the #1 box office actor today? Does he act better than Mark Wahlberg, Joaquin Phoenix, De Niro, Pacino etc.? No. He is a screenwriter and story genius. He understands which scripts will make money. Without the knowledge taught in this course, you stand a better chance of winning the lottery than making it in movies. A bold statement but painfully true. Story structure is not just another aspect of screenwriting. It's what makes or breaks your movie career. This is the last opportunity for 2007 to take this course in one day. Of the 10 available places for each day, some will be taken by fimmakers on the waiting list from last month's course. Don't miss out this time! Screenwriters - Does your concept hold up? How to improve the structure? Actors - Which projects to fight for? Which projects will kickstart your career? Producers & Directors - How to distinguish between hits and duds. 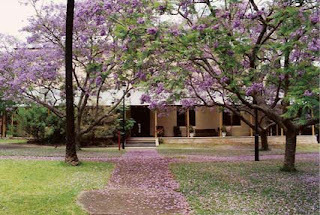 The wonderful, sensational and inspirational NSW Writers Centre under the jacarandas of Callan Park, Rozelle where parking is never a problem. Check out the second hand book shelf with gems at $2 to keep you entertained during the breaks. "Karel's course is excellent. It finally sunk in, having studied structure twice previously with high calibre teachers. Karel delivers crucial basics, sound models and advanced techniques that work. Thank you Karel for sharing your extensive knowledge." "I came to you with a bunch of scenes in the hope of finding a story and when I look back I'm still surprised at how far we have come. Now the script has won the 2007 Monte Miller award. Thanks again Karel." "He never gets distracted with the little stuff that tends to fix itself when the important parts are working harmoniously. Karel is a rare beast amongst story consultants - a film literate and long-standing aficionado of many film genres. I hold Karel in very high regard."